Stop your garden hose from overrunning your plants while adding a natural theme to the area with the Achla Leaf End Hose Guides. Placing a guide along the edge of your landscaping helps direct your garden hose away from your plants, ensuring the yard remains beautiful. 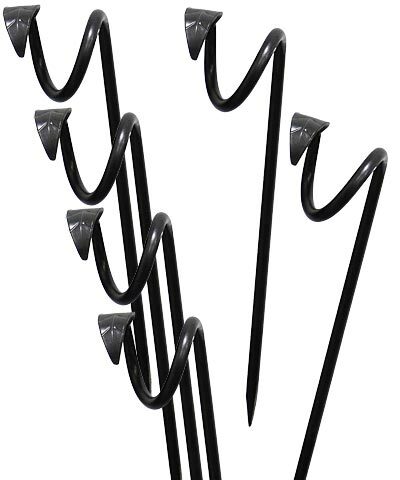 These six guides all have a pointed end, for installing in your soil easily, and a spiral at the top for holding your garden hose. A metal leaf accent rests at the top of each stake, bringing a fun hint to them, and the deep gray hue meshes with any setting. The durable, wrought iron body ensures a lasting guide, and the powder coated finish protects each unit from rust. Water your plants without damaging them with your hose using these Leaf End Hose Guides. Note: This case pack includes 6 of the Achla Leaf End Hose Guides.